Hearing protection selection using noise measurements: the techniques and the pitfalls! The EU Noise Directive and the noise legislation that spread across Europe as a result, impacted companies of every description. According to their respective safety professionals, P&O found that it couldn't drop anchor without providing appropriate hearing protection to deckhands close to the descending chain, and Rolls Royce Turbine Division discovered that overnight it now had fi ve noise hazard areas on a site that previously only had one. Measuring noise levels and producing reliable and accurate data and translating it into effective control measures or appropriate PPE selection seemed like a complex task for many health and safety professionals. Consultants were often called in to make assessments and issue recommendations when health and safety or occupational health staff could have conducted the surveys themselves using a new generation of dose and noise level meters designed to be used with minimal training. Advice from the UK's Health and Safety Executive (HSE) on assessing workplace noise levels state that if you have to shout to be heard two meters away then ambient noise levels are likely to be around 85dB. If normal conversation is possible despite intrusive ambient noise then the level is likely to be 80dB. Casual and subjective assessments like this are fraught with difficulty, but give a rough benchmark from which to start thinking about noise. If measurements subsequently confirm that levels are below the first action thresholds, now set 5 dB lower at LEX,8h of 80dB (A) or LCPeak of 135 (C), no action is necessary. Note that in the UK LEX,8h is referred to as LEP,d The second action level is LEX,8h of 85dB (A) and an LCPeak of 137dB(C), and this created a new 5dB band between 80dB and 85dB in which hearing protection must be made available to employees who ask for it. Things get more serious above 85dB, when a risk assessment must quantify the level of noise and the extent of staff exposures. The new action levels represented a drop of 5dB on existing limits, and while not sounding like much it more than halves the permissible noise energy to which workers can be exposed, and in the UK alone brought an additional 1.1 million people under the umbrella of the legislation. The EU Noise Directive demands that employees who are regularly exposed to 85dB be placed under suitable health surveillance that includes hearing tests and properly maintained health records. It introduces the concept of exposure limit values at the ear, which take into consideration the attenuation of the hearing protection; this limit is set at LEX,8h of 87dB(A) or an LCPeak of 140dB(C), and must not be exceeded. Clearly, an accurate assessment of workplace noise is absolutely vital. The LEX,8h is a measure of the total noise received by an employee over an eight hour working day based on noise levels experienced and duration of exposure. A high level noise for a short time will give the same noise exposure as a lower level noise for a longer time. For example, an employee working for 8 hours in a noise level of 75 dB(A) will have an exposure of 75 dB(A) LEX,8h. The LEP,W is the weekly personal noise exposure and measures the total noise received by an employee during a five day, eight hour week. The new Peak sound pressure level is written as LCPeak and is the instantaneous C-weighted peak sound pressure level occurring at any time, it is sometimes abbreviated to LCPk. This data is for a standard disposable earplug. Protection is better at higher frequencies, which is the case with most hearing protection. The effectiveness of a protector at various frequencies varies between PPE, so it is necessary to match the frequency of the noise produced to the noise the employee is exposed to. Generally, earmuffs provide better protection at higher frequencies above about 250Hz, but earplugs are on average slightly better at lower frequencies. All the three methods describe 'frequency weightings' of either 'C' or 'A'. This is the way a sound level meter converts the decibel value it measures which is all the frequencies of the noise evenly, and converts them into a value to represent how the human ear hears the noise. Essentially the ear does not hear low or high frequencies very well, but actually exaggerates noise roughly between 1000Hz to 4000Hz. The ear does this because most of our speech takes place at these frequencies. The 'A' weighted scale is shown below in the 'Octave band method' description. The Single Number Rating (SNR) method is the simplest form of calculation but does not take into account the frequency content of the noise in any depth. To do this simply take the SNR value quoted for the hearing protector away from the 'C' weighted sound level which needs to be measured for the employee in question.The dB value at the ear (L'A) is calculated by: L ' A = L C - SNR. The value of LC is a measured value of the sound level. It can be difficult to get an idea of this fluctuating value on the screen of a sound level meter so it is highly recommended that you get an instrument that provides an averaged result called LEQ. This value is rounded to the nearest whole number, which is the recommended way for decibel values once the calculation is complete. This result means this protector would be adequate if worn in the correct way. Where PNR is the predicted noise reduction provided by the hearing protector and H, M and L are the values provided by the Personal Protective Equipment (PPE) catalogue. The HML values stand for high, medium and low which are the values for the attenuation at high, medium and low frequencies. There are two formulas because, by taking two values of the sound pressure with different frequency weightings (LC and LA), then this is giving an indication of the frequency content of the noise the employee is exposed to. The two formulas distinguish between noises with low and high frequency contents and different values are used from the high, medium and low combination. This would make the value at the ear: L ' A = 102 - 25 = 77dB(A). The result is exactly the same as for the SNR method. This method requires the use of an octave band sound level meter to take the measurements. To do the final calculations, a calculator with the Log function is required. The use of this method is considered the most accurate way of measuring the effectiveness of hearing protectors because it is looking at the actual frequency content of the noise that are present for the employee. The table shows an example measurement taken from a sound level meter for a different employee. The A-weighting factors that are standard values are shown below. By taking the assumed protection and the A-weighting values away from each octave band sound level will give the A weighted value at the ear for each frequency. For example at the 63Hz octave band. Although this was for a different noise source than for the first two examples it still shows that the protector would be adequate. Under recent UK changes to legislation this protection is taken further in that the assumed protection is further reduced by 4dB under all three of the above methods. This would make the dB value at the ear 80dB(A) instead of 76dB(A). Hearing protection should be selected so that it reduces exposure to at least below 85dB(A) but ideally between 75 and 80dB(A). This provides calculators for the SNR, HML and Octave band method and so avoids any complex math! While there are many questions to be asked in the process of selecting herring protection, the most fundamental one is will staff willingly wear the PPE selected? There is no point buying the most expensive earmuff that attenuates the noise by, say, 30dB(A) if the employee has to remove the muffs for two hours of an eight hour shift because they are uncomfortable. That will only reduce the daily noise exposure by 6dB(A) instead of 30dB(A)! Finding an appropriate hearing protector is largely down to common sense; earmuffs would generally not be supplied in a hot and humid environment where they would be sweaty and uncomfortable. Employees often like to choose their PPE themselves and a worker is more likely to wear the protection they have chosen over the one they have been told to wear. Often employees working in the same environment will have different preferences: some prefer plugs; some prefer ear muffs and others will go for inserts. The ultimate for 'individualisation' in hearing protection is custom-made earplugs made from silicone, moulded especially for the person's ear. 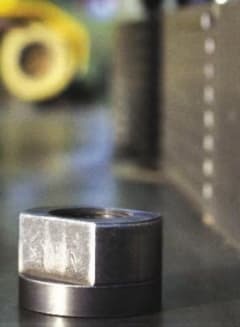 Although initially expensive, they are more likely to give the required fit and therefore the required protection, and the employee is more likely to look after his or her 'own' unique plug. The level of motivation and training an employee has in the use of their hearing protection has a considerable influence on the effective protection offered by the product. In the USA all hearing protection devices are currently sold with a Noise Reduction Rating (NRR) printed on the packaging, and for years safety professionals have enjoyed the apparent simplicity of a single number that can be used to differentiate products during the purchasing process. From this year the single number became a two number range with the higher number indicating the amount of protection which a motivated and trained wearer can attain or exceed, and the lower number will indicate the protection which the other less motivated users can expect. The range shows how consistently the hearing protectors provided protection within the same group. By subtracting the lower number from the higher one and comparing the difference to the same calculation with other products, the purchaser will get a good idea of the uniformity of protection given; the smaller the difference between the low and high figures the more consistent the efficiency of the products amongst workers. The change in the US will bring about a new appreciation that the protection levels offered by a hearing protector varies, and no single figure can adequately describe the changing levels of protection offered between one wearer and another. It may show that selecting and specifying hearing protection might come down to issues that have in the past been considered secondary such as comfort and ease of use. The interaction of hearing protection with other PPE is another consideration: an employee wearing prescription or safety glasses will not obtain an adequate fit from a standard ear muff so plugs or perhaps semi-inserts become the better option. The use of hardhats with earmuffs can still be an issue. If the employee constantly needs to wear them both together a hard hat with built in hearing defenders should be considered. Communication can be a big question with PPE and it all comes down to the attenuation. If a protector with too little attenuation is used then not enough protection will be given. However, too much reduction of the noise can create a feeling of isolation that is detrimental, and an employee may need to remove their PPE in order to communicate. The subsequent exposure to noise will therefore far outweigh the benefits that a high attenuation hearing protector would have provided. Another problem with over attenuation of a hearing protector is that of safety. There is an inherent danger in providing too much protection which cuts out the safety warnings of fire alarms and sirens from reversing vehicles. A general rule of thumb is to not providing so much protection as to reduce the level to below 75dB(A). Other individual preferences such as hair and jewellery affect the choice of hearing protection. Long hair that flows over the ears will cause an inadequate fit of an earmuff and hence a significant reduction in the effectiveness of the protection and earrings will cause a comfort problem. Determining the noise levels within locations where hearing protection measures may be needed relies on the use of accurate, reliable and fast monitoring and measurement equipment. Using measurement and calibration equipment that incorporates the latest technology eliminates range adjustment errors, the most common cause of incorrect readings, and brings confidence in the data. This is particularly important when making the octave band measurements required for the most accurate assessment of hearing protection. Some sound level meters that offer real-time octave band analysis have a single measurement range, which removes the possibility of range adjustment errors. Simultaneous measurement reduces measurement time and associated cost, and ensures a high standard of data. For example, the CEL-620 and CEL-621 are both preconfigured with international noise at work standards ensuring that no mistakes can be made with instrument settings. Given the logarithmic nature of the decibel scale, a variance of only 1 or 2dB can often mean serious misinterpretation of noise levels over a day or a week and the worst case reading should be used for the assessment, particularly when close to an action level. The dosemeter makes all this unnecessary, and if employees wear them for complete work shifts the noise dose is measured in full no further calculations are required. Most modern dosimeters, like the CEL 350 and CEL-352 dBadge will also project the noise dose forward to the standard 8 hours, so no calculations are needed if only a partial shift is monitored. Dosimeters are becoming smaller and smaller, and the Casella CEL products are unobtrusive enough to be worn on the shoulder, and so there are no loose microphones or cables. With no cabling to get in the way employees are less resistant to wearing it and more likely to forget it is there. However even with such unobtrusive products some employees and their colleagues won't resist the temptation to shout into the microphones and play with the buttons; it's best to ignore the first few days' results, until the novelty wears off. Another useful feature of noise dosimeters is that they will 'log' the noise data so that, when downloaded to a PC the time history of the noise can be viewed graphically. This gives the ability to analyse when and where high noise exposures occurred, and if the employee is happy to keep a diary of what times and jobs he or she was performing throughout the day the employer is able to see immediately which operations most need action. Measuring noise at work and individual worker exposures for risk and compliance assessments is no longer the exclusive domain of the specialist consultant. With a new generation of noise measuring technology that demystifies the process and makes the decisions about control measures and PPE selection straightforward, any safety manager can undertake the assessment, and maintain a listening watch for changes at work which may affect compliance.